Our journal is digitally archived at DigitalCommons at the University of Nebraska - Lincoln. Explore old articles and issues or search for a topic of interest. 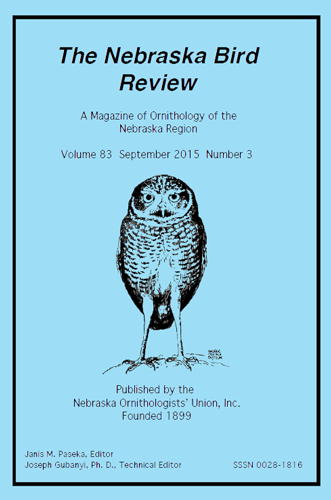 The Nebraska Bird Review is published quarterly by the Nebraska Ornithologists' Union, Inc., as its official journal, and is sent to members not in arrears of dues. Annual subscription rates (on a calendar-year basis only): $25.00 in the United States and $35.00 in all other countries, payable in advance. Single copies are $7.00 each, postpaid, in the United States and $9.00 elsewhere. Annual report of the NOU Records Committee, listing accepted and unaccepted records, changes in frequency of occurrence, taxonomic revisions, etc. Articles on Nebraska birds: appearance of unusual species, populations studies, breeding distribution, nesting ecology, etc.